The gold reverse-half moons are Sally Hansen Complete Salon Manicure Gilty Pleasure with American Apparel Mount Royal for the blue. 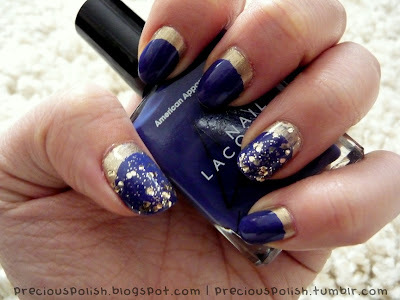 The chunky gold glitter is Sephora by OPI Only Gold for Me Top Coat. Whilst I was in London I managed to pick up some exciting products! The trip itself was wonderful. I saw all of the incredible museums and landmarks of London and Paris while making some new friends. It was a tiring trip and the plane rides were horrible but I'm really glad that I went! Another plus: The shopping was amazing. While at Topshop I picked up four polishes by Barry M for £2.99: Dusky Mauve, Red Glitter, Blue Glitter and Silver. I was initially ecstatic about finding Dusky Mauve because I knew it was a dupe for Chanel Paradoxal. However, when I painted my nails with it I realized that I'm actually not a huge fan of the colour. I'm excited to try out the glitters though; the brightness and shade of the blue is incredible! 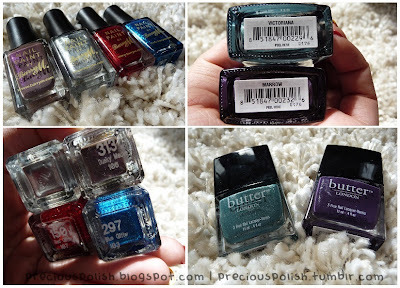 I was over the moon to find butter LONDON polishes at Oasis for an astounding £5.00! They go for $17.00 CAD. I bought just two shades: Victoriana and Marrow from the Fall 2010 collection. At Lush I bought a tub of Lemony Flutter because I had heard great things about it. The lemon scent is heavenly and I have noticed a difference in my cuticles! I also bought two of the lip scrubs. I got Sweet Lips for myself, a vanilla-chocolate scent, and Bubblegum for my sister. They're delicious and exfoliating! I used American Apparel Manila on my index and ring fingers and American Apparel Poppy on the rest of the nails as a base. 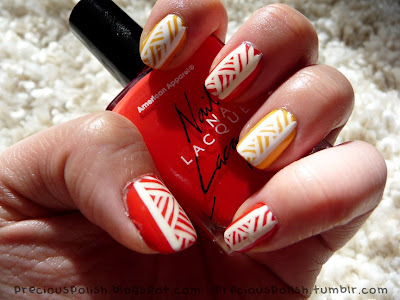 The aztec pattern was painted with a white striping brush.